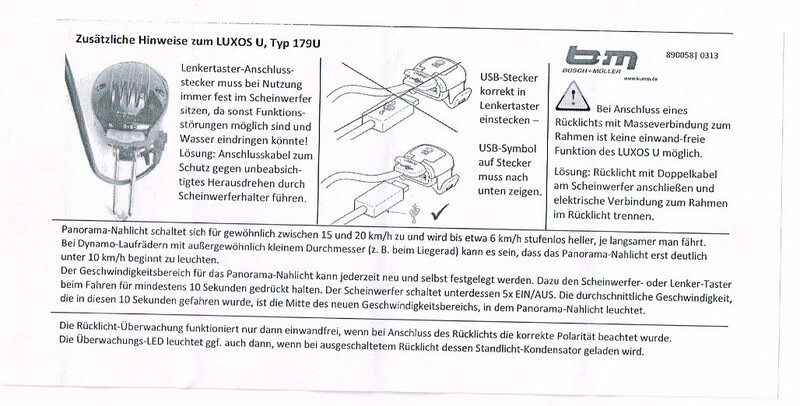 One of the forum members at the Australian Cycling Forums received his Luxos U this week and it included an additional piece of paper from Busch & Muller ... maybe in response to the issues being reported. Woohoo! Got home to find a box from Rose, containing my new Luxos. It's a shiny, handsome looking beast. I must stop reading this thread, it's all getting kinda tempting. But I am perfectly happy with my Cyo and don't need USB charging. Honestly! Your review + the fact that I smashed my cyo in a crash last week means that I've just ordered a Luxos from dotbike. Was toying with just getting another Cyo as I have a dahon reecharge that can be used for charging duties (yes it still works!). But it was the neatness of the solution + the promise of more light output that sold it to me. May consider not using an external cache battery and just plugging my phone (galaxy s2) straight in for a neater and more efficient charge. If the USB output comes directly from the internal cache, then it's gonna be OK isn't it? You must not stop reading this thread - we need you to translate Aushiker's leaflet! have put me off rather. Two out of four lamps buggered by water ingress. How reliable is a push-fit cable connection? I would imagine it is the sort of thing that might get dislodged without you noticing. got my REPLACEMENT B+M Luxos USB light on Monday. Oh dear. That sounds a bit rubbish. The chances of one of these surviving a wet Bryan Chapman or LEL2009 seems remote . I thought the German said water can get in when the cable is plugged in (...und Wasser eindringen konnte! ), but I really don't know it well enough to be sure. I could be wrong, my German isn't fantastic. It's not an ideal design anyway. I'll wait for a revised model of the cable to come out before I'd upgrade. Ideally the switch should be separate from the USB charging port. The switch can then be completely waterproof and sit out in the rain. The USB charging port can then be buried in a bag (top tube, front pannier, bar bag) or just wrapped in plastic to keep it safe from water ingress. Mind you, if you ignore the BEAMS OF DETH mode that the switch gives you then you can just hide the switch/connector away from the rain all the time anyway. From what I can make out, the first column is saying that the handlebar connection thingie must always be firmly fitted into the headlight when using so that water can't get in and that it functions properly. It then offers a solution (but doesn't really specify the problem!) which is to make sure the connector cable is routed through the headlamp bracket so that it doesn't unexpectedly get pulled out. Add gaffa tape and you've solved close to 100%. WD40 and a hammer and you're there. As for the switch, the idea for getting this unit was to get rid of the E-Werk, done that, and the Tri type bag on the top tube with a cache battery and all the extra cabling. All of which has served to nudge me firmly toward bag-drop cache batteries for LEL. "The the wire and plug to the Handlebar-control unit/button, must, if used, always be firmly connected to the head lamp, or else it is possible that the functionality (of the lamp) is disturbed, or that water can ingress! Solution: The connection cable should run through the head lamp holder, to protect it from accidental unplugging." To me it just look like a simple suggestion to how to run the connection wire, so it doesn't accidentally snag something. Just basic cabling technique really. The bit about water ingress is just stating the rather obvious fact, that when unplugged, water may enter through the hole. I will just paraphrase this: " To correctly plug the USB-plug into the the handlebar-control unit/button, the USB symbol on the plug should face downwards". I will just paraphrase this: "It will give functionality problems, if you connect the Luxos U to a rear lamp that uses the frame as grounding (single wire). The solution is to isolate the rear light from the frame, and use a double wire to connect it with the Luxos." Just the essence: The Panorama light is turned on depending on speed (or rather power input from the hub). So bicycles with small wheels may experience that the Panorama near light doesn't function optimally for them. The solution is to re-program the Luxos as to when the Panorama light turns on. This is done by riding at the desired speed, while holding down the handlebar-button for at least 10 seconds. During that the time the lamp will switch on and off five times, and the average speed of the 10 second run will be calculated and used for making the new speed limit for when the Panorama near light is turned on. The calculated average speed is used as a the middle of the speed range in which the Panorama near light function. I must say that this is hard to translate since I don't know how the Luxos Panorama light functions normally, but the gist is that one can re-program when the Panorama near light is turned on, by holding down the button for 10 seconds while riding. Hardly unexpected though, is it? USB connectors are many things, and waterproof simply isn't one of them. B&M did this properly on the e-Werk, and it meant an assortment of adaptor cables. A better solution IMHO would have been for the Handlebar switch and USB power to be separate, so the wiring could live in some waterproof luggage. I believe Neutrik have a ruggedised version, along the lines of their ruggedised RJ45 connectors. But those are heavy, and only IP rated when mated with each other. Indeed, you're never really going to have a waterproof link with a USB connector, and the best approach is probably to not use that facility when the weather is inclement. The Neutrik connector is a bit like a USB connector inside a USB shell, so as you say is only going to achieve any sort of IP rating when mated to the matching component. Hi. I've been observing some forums and responses about LUXOS U. Thanks for your shares and thoughts here! I don't have this product, but I'm interested in this solution too, as it solves (or should?) main problems for bicycle tourer's concerns: USB (out: 5 V, min 500 mA), stable current (GPS with no battery), good lamp in one bundle. It's obvious, that specs may be reached only by using cache accumulator and it's clear, that this component will not last long (especially for tourers, running device for a long time/distance). Rechargeable batteries have a limited life time (age) due technology they use. They degrade and need a replacement after some (~2-3+) years (it depends on battery type, capacity, cycles, temperatures, how it's used & etc...). It's true, as those accumulators, that are Li-Ion, LiFePO4 and other Li+something are more advanced, but – dangerous and usually in that case – non standard, need a dedicated controller/charger, and most important – they can easily get into the flames and even may burst on wrong usage or damage (we know a lot stories about smartphones and laptops on fire). So, it's nothing unusual, that manufacturers use non replaceable (or not easy replaceable) batteries of this type, out of reach for inexperienced customers. There's no information about it's life time on web and BUMM support do not reveal it. I've wrote 7 emails to them to find out, how long I should expect this thing to be functional, or any technical data about battery they use, to predict it's death or even replace by myself or local electronics specialist. Finally, I understood, that support may been instructed not to give answers about that at all: "I do really understand your misgivings, but I do not have other information for you." All I've got useful was: "you can load the cache battery about minimum 500 full cycles (e.g., 10x with 10% of the capacity loaded and unloaded)", or their service can replace dead battery: „You have a warranty period of 2 year by your dealer. But if there is a malfunction on the cache battery, we can replace it for sure free of charge. We cannot give you the exact name of the cache battery..." and "if there would be a malfunction of the cache battery or of the light, it doesn't matter to us, how old the light is. We would replace it for free." Doesn't look convincing, does it? It's obvious that some electronics manufacturers deliberately hide this information, as they plan to offer new products after about warranty time ends and keep business running. There's no interest to make a long lasting thing nowadays. Sure, there are fair manufacturers, that say to a customer: yes, it's not only a warranty time, but it's near about the same product's life time, as battery is inbuilt, it gets worn and non replaceable; after of 2-3 years (?) of use, you should know, that this item is going to a trash bin. It's justice then. But BUMM tell me nothing about that. Easy replaceable accumulator (like in mobile phones) for this kit may be good thing, but it may rise product size and price too. I hope, It's another step in product development, as sealing it from water ingress too (but it should be vented, as it's large and may create condensate in it). Most of us want this thing to be used outdoor in harsh conditions (rain, sun and frost) and predicting it's life time in order not to stuck with it in remote areas. BTW, I'll add another report about strange light behaviour. When driving in daylight and greater speed (approx.> 20 km / h) can no longer turn off the headlights. Under the pressure of the spotlight 3s goes for about a few hundredths of a second and immediately back on. P. S. Sorry for my poor English. If it's lithium-ion, it may have a reasonable service life on a bike; they hate getting too hot and being left on a constant charge. I have a battery in a Motorola V3 phone that has apparently not deteriorated at all in 5 years; the phone is only charged when it needs to be and the power draw is sufficiently low that (unlike a smartphone battery) it doesn't get hot. Standby time is still about a week. If the electronics are kind to the B&M cell, it could last a long time; it's not enclosed in a plastic case and plugged into a transformer for almost all its existence. NiMH batteries deteriorate very quickly; I have to buy a new set every year for my Hope Vision 1 light, because the previous year's set won't last more than 2-3 days when they used to last 5.